Researchers at Pacific Northwest National Laboratory developed a very sensitive measure of protein modifications in cells to allow scientists to look at specific sites in a cell where they know certain functions are carried out. 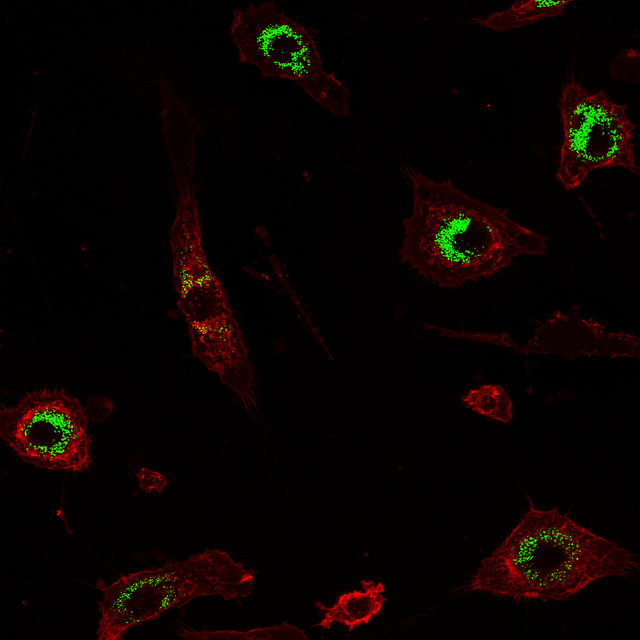 They analyzed modifications in mouse macrophages (shown here in red) by nanoparticles (shown in green). Enlarge Image. This appeared as a PNNL news release January 13. Results: Scientists have shown that a process known as oxidative stress is at work during encounters between certain nanoparticles and immune cells, selectively modifying proteins on macrophages, a type of immune cell. The findings, by researchers at Pacific Northwest National Laboratory, were published in the journal ACS Nano. Why It Matters: While oxidative stress is a common way for cell damage to occur, the findings were a surprise in some ways. "Oxidative stress is occurring selectively even at low levels of exposure to nanoparticles," said Dr. Brian Thrall, a nanotoxicology expert at PNNL and a corresponding author of the study. "We've demonstrated an approach that is sensitive enough to detect effects of nanoparticles on macrophages long before those cells die. This gives us the opportunity to understand the most sensitive cellular targets of oxidative stress and the pathways involved more completely than before. "This is important information for understanding how nanoparticles can alter cell function and for beginning to identify functions that allow cells to adapt versus those that are potentially involved in adverse effects," Thrall added. Nanoparticles are typically smaller than 100 nanometers wide, less than one one-thousandth the width of a human hair. If a standard basketball were blown up to the size of the Earth, a nanoparticle enlarged proportionately would be roughly the size of a beach ball in comparison. The particles are used broadly in biomedical applications, clothing, the electronics industry, cosmetics, food packaging, and sunscreens; they're also a component in many forms of air pollution. As scientists have refined their ability to make a diversity of nanoparticles used in manufactured goods, there is a greater need to study their potential effects. Oftentimes, these studies look at whether or not exposure to the particles results in cell death. The PNNL study is more nuanced, looking in more depth at specific proteins in cells that are the targets of oxidative damage caused by nanoparticles. "This study shows that some nanoparticles that we consider non-toxic can have many effects on macrophages," said PNNL analytical chemist Dr. Wei-Jun Qian, also a corresponding author of the study. Methods: The findings depend on a method recently developed by PNNL scientists to measure protein oxidation at very specific sites in cells like macrophages. Qian developed a very sensitive measure of protein modifications in cells to allow scientists to look at specific sites in the cell where scientists know certain functions are carried out. The method, known as a quantitative redox proteomics approach, uses an advanced mass spectrometer to look at thousands of sites involved in redox reactions simultaneously. Cobalt oxide, which causes high levels of oxidative stress and can also cause cell death and lung toxicity. The team took a close look at more than 2,000 cellular hotspots where a process known as S-glutathionylation, a specific type of protein modification known to be involved in immune functions when a cell is under oxidative stress, occurs. In macrophages exposed to nanoparticles, the team found molecular "footprints" of activity—an increase in S-glutathionylation. However, the specific pattern of oxidative modifications on proteins varied depending on the type of nanoparticle. By looking at these modifications, researchers were able to identify specific molecular pathways that were most sensitive to low levels of oxidative stress, and distinguish those from other pathways that were associated with high levels of oxidative stress linked to cell death. The idea that a nanoparticle would damage the body's macrophages is no surprise: Macrophages are the body's first responders when it comes to recognizing and neutralizing an invader. Some nanoparticles can weaken macrophages' ability to recognize, hold onto and engulf the particles. Two years ago, Thrall's team showed that when macrophages are exposed to nanoparticles, the cells don't work as well and are less able to recognize and remove Streptococcus pneumonia, the leading cause of community-acquired pneumonia. The pattern of protein changes identified in this study provides new clues to the types of nanoparticles that cause these effects and the proteins involved. Qian developed the method as part of his work studying redox reactions, which play an important role regulating photosynthesis in plants. Understanding how plants capture, process and funnel the Sun's energy naturally helps scientists develop efficient new energy systems to do the same. Qian has used the system to discover more than 2,100 molecular locations where redox reactions are likely to occur in cyanobacteria, which are important for producing biofuels. Sponsors: The work was funded by an Early Career Research Award from the U.S. Department of Energy, Office of Biological and Environmental Research; an NIH Director's New Innovator Award (both for Qian's group); and the National Institute of Environmental Health Sciences. Research Team: Jicheng Duan, Vamsi K. Kodali, Matthew J. Gaffrey, Jia Guo, Rosalie K. Chu, David G. Camp, Richard D. Smith, Brian D. Thrall and Wei-Jun Qian, all PNNL. In one sentence: PNNL scientists showed that oxidative stress is at work during encounters between certain nanoparticles and immune cells, selectively modifying proteins on macrophages, a type of immune cell. In 123 characters: A new study shows that some nanoparticles considered non-toxic can have many effects on macrophages, a type of immune cell.